Tool for managing two virtual memory cards at the same time. 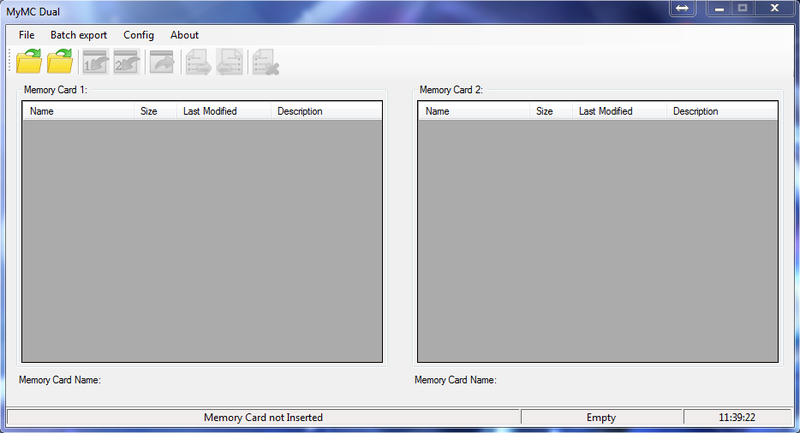 “MyMC Dual” is a joack version of the mymc memory card utility, this version allows to managed two virtual memory cards at the same time. Note: For Windows 7 or higher this application need to install windows framework 4.5 o higher. Note: For Windows XP this application need to install windows framework 3.5. The thanks go to the respective authors. I only base my program on their respective works. Close MC1: Close memory card side 1. Close MC2: Close memory card side 2. 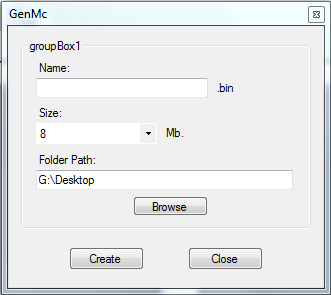 Create MC: Allows you to create a new memory card, this option open a new window. Exit: Exit from the application. Name: Name of the new memory card, if the name box is empty when you press the “create button”, the program will assign a default name. Size: this dropdown allows you to select the size of the memory card (8, 16, 32 and 64 MB). Folder Path: this is the path where the new memory card will be created. In this menu, you can set the save format when you export files from memory card. As .psu: All files will be exported to EMS format. As .max: All files will be exported to Drive Max format. Output dir: This menu allows you to choose the directory where the exported files will be placed, this option open a new window. This buttons perform the main actions of the program. Allows you to import save files to memory card side 1 or 2. You can import multiple files at once. Allows you to export selected save files from one of the memory card slots. You can export multiple files at once. Allows you to transfer save files between memory cards. You can transfer multiple files at once. Allows you to delete save files. You can delete multiple file at once. When you open a memory card, the content will be displayed on the selected slot. Column Name: Shows the internal name of the save file in the memory card. Column Size: Show the save file size. Column Description: Shows a little description of the save file. Memory Card Name label: This label shows the current name of the open memory card in that slot. This bar shows information about the selected memory card. The first box shows the current path to the selected memory card. This is useful because it lets you know which memory card you are currently working with. The second one shows the free space for the current selected memory card. The last one shows the current time. Note: If you press the left click button on the first box, a new window will open to that selected file . -- Fixed some error when try to load memory cards above 8MB. [*]Select all save files in the list. [*]Copy the selected save files to the other slot. [*]Copy all save files to the other slot. [*]Move save files beetwen slots. [*]Delete the selected save files. -- Added new menu item 'Tools',  and a memory card converter  ( bin <--> ps2 ) with and without ECC Block. -- Rename 'Batch export' menu to 'Batch actions' and add new items. -- Ability to create memory cards with ECC Block and without ECC Block..
-- Fixed bug when trying to create memory cards in folders that contained white space in their name. -- You can now delete saves using the DELETE key. -- Support for memory cards with ECC Block. -- Fixed some errors when trying to export files. -- Added a new feature: Drag and Drop raw save files (still experimental). -- It seems that when the memory card was in a folder with white spaces in its name, the program went into error. I was able to fix that mistake in the end. It is now functional.